Alcudia beach Rock private pool in Alcúdia is a holiday home with 1 room. Set in Alcudia, within 2.5 km of Alcudia Old Town, Alcudia beach Rock private pool offers accommodation with air conditioning. This holiday home also has an outdoor pool and free WiFi. The holiday home consists of 3 separate bedrooms, 2 bathrooms with free toiletries and a living room. A dishwasher, an oven and a microwave can be found in the kitchen. The holiday home offers a terrace. A bicycle rental service is available at this property, while cycling and fishing can be enjoyed nearby. Palma ...de Mallorca Airport is 62 km away, and the property offers a paid airport shuttle service. Set in Alcudia, within 2.5 km of Alcudia Old Town, Alcudia beach Rock private pool offers accommodation with air conditioning. This holiday home also ...has an outdoor pool and free WiFi. The holiday home consists of 3 separate bedrooms, 2 bathrooms with free toiletries and a living room. A dishwasher, an oven and a microwave can be found in the kitchen. The holiday home offers a terrace. A bicycle rental service is available at this property, while cycling and fishing can be enjoyed nearby. Palma de Mallorca Airport is 62 km away, and the property offers a paid airport shuttle service. 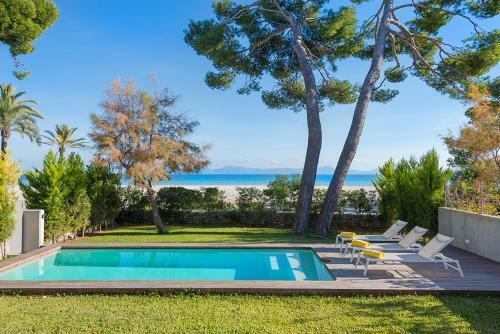 When would you like to stay at Alcudia beach Rock private pool? This property will not accommodate hen, stag or similar parties. A damage deposit of EUR 900 is required on arrival. This will be collected by credit card. You should be reimbursed within 7 days of check-out. Your deposit will be refunded in full via credit card, subject to an inspection of the property.